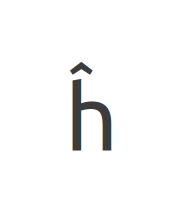 The character would be much prettier, if the circumflex would stay exactly in the middle over the stem of "h", so a bit more to the left (like ex. in DejaVu Sans). Please can you attach a screenshot showing the rendering on your exact system. The attached screenshot is blank and has no characters rendered. Yes, the character is really clumsy, despite of that, the solution of the circumflex centered over the ascending stem is the best one in my opinion. See for instance the typeface "Fertigo", eventually serif "Warnock" or "Minion" by Adobe. Given that just such a solution (centreing about the stem) is used for Ĵ (J circumflex), I don't see why it wouldn't work for ĥ. See attached PDF for comparision. 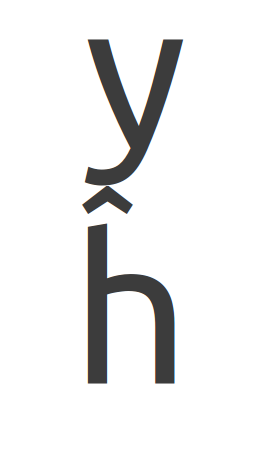 There is also a problem with the height of the char: probably the highest one from Latin-A – if there is the character "y" in the upper line, they are nearly touching one the other, which is really unsightly. Petr: you will always get potential near-misses between descenders on one line and ascenders on the line below, it happens fairly infrequently (statistically low chance). The degree to which those near misses are visible depends on the leading (line-spacing), and quite often people typeset with this in mind eg. "12pt/14pt" (12pt text with 14pt spacing). Thank you for the SVG too, this seems to confirm (see the "h-circumflex.pdf" attachment too) that the centreing above the stem seems to work for the placement of the circumflex.